This is one of my favorite annual deals, and I’ll show you how you can get even more value from the offer! 10% cash back at many stores – 12% at Neiman Marcus!! 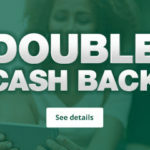 Shopping Portals are your friend, especially when they run double cash back promos! Earn 15% Cashback at Your Favorite Stores Today! Consider this a Cashback 101 lesson for Runners and Athletes, and frankly anyone who shops online.